Last week I decided the only way I was going to get to work on Deco during the cardi KAL was if I parked it inside the passenger seat of the car for summer day trips, so I did that and on the weekend I finally got going. Yay! Then, about three rows in, I noticed my yarn was tangled. 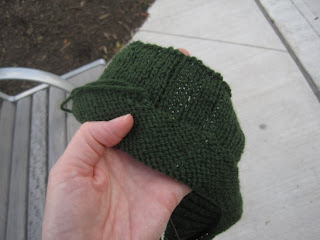 How that happened: After the first two frogs, I rewound the yarn around the cone, but looser than it had been before. Pulling my working yarn off the cone from the bag I've been storing it in, more of the coils came off than were needed - coils from many, many previous winding points. More and more, in fact, as I knitted merrily along without noticing the problem. When I did spot it, I had to pull a whole hunk off the cone just to fix the tangle. I worked on the knots en route to Dinner Out, cursed myself for not bringing it into the restaurant (for which I would have been cursed had I done it), worked on it after Dinner Out and before Ice Cream Out, after Ice Cream Out (I had mango sorbet, and it was very nice) and after I got re-installed on the porch. I tried to take a picture of what it looked like half an hour after that, but the sun was nearly down by then. Here's the thing. 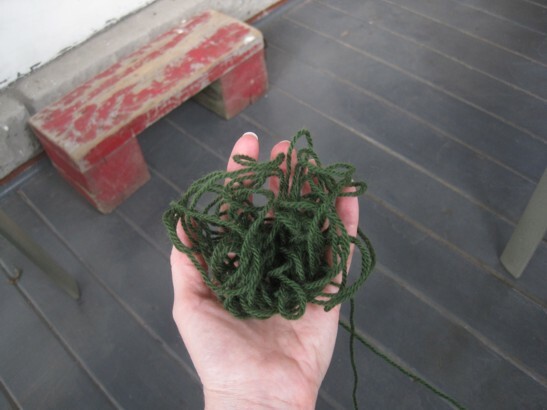 You can untangle a knot for just so long before you start weighing the value of continuing. You want to rescue all that yardage, but you also don't want to compromise the integrity of the project with a patch of wool that was worn and sad before it even got knit in. Plus, how much knitting time are you willing to lose? And on the other hand, once you've invested 90 minutes in getting out a knot, don't you kinda half to go on and get the job done so you haven't lost 90 minutes of knitting time for nothing? And on the other hand you wish you had so you could get more done in a day - who wants to run in ends when working on a cone?? The whole point of a cone is not having to run in ends!! But of course the fourth hand knows that running in two ends takes about 3 minutes of which 2 are spent locating some scissors and a darning needle. I only lasted the extra half hour, which put me I think at 2 hours of untangling before I went inside and got the scissors. 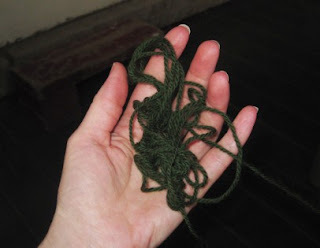 The yarn I was releasing from the knot was just an absolute mess by then anyway. Yesterday I was in the car a lot again and after running in ends on one distracting Top Secret project and doing my daily spinning time - yay spindle - I had about an hour free for Deco which put me about half as far ahead as I would have been had I just cut the knot in the first place.